Perennial. Z2. This is a relatively new cultivar, introduced in 1998. 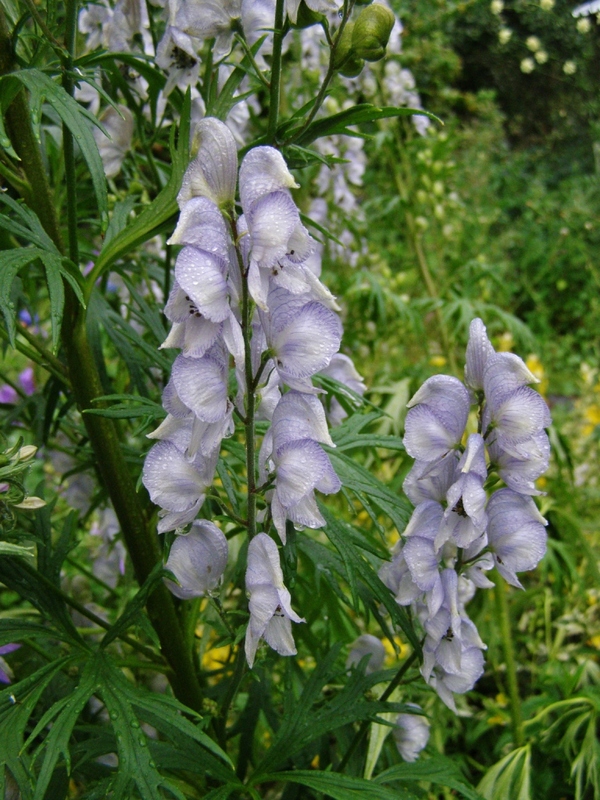 It is a hybrid of the gorgeous bicoloured monkshood, Aconitum cammarum, and a Himalayan species, A. spicatum. The individual hooded flowers look rather like bleached out versions of its variegated parent, being grayish white with faded purple veins, with a darker stamen cluster, but the overall effect is really something quite wonderful. Instead of the loosely arranged florets of A. cammarum, ‘Stainless Steel’ produces densely flowered spikes. The plant is very vigorous and reliably sturdy, and the 3 to 4 foot stems stand tall without staking. It blooms for me for a very long time, through July and August, with reliable autumn rebloom if the first spent spikes are trimmed back. It sets abundant seed, but so far I have not seen any seedlings; I suspect that it may be a sterile cross. The photo included here is of the secondary bloom; the first spikes are much more lush and full. If you see this one anywhere, buy it! It’s an excellent Monkshood. I may have a few divisions to spare this spring, as I’m thinking of moving my 5-year-old parent plant, but this depends on what I find when I get the clump out of the ground. Some Aconitums divide quite readily, while others are difficult to separate without damaging the crowns. I’m including it in this list just because it is so grand, and I’d like to recommend it, even if it’s not for sale from us! Site carefully, as it does take a few years to really get going, and will resent being moved around too much, if it’s anything like its relations. Light shade is best, with good soil and some summer moisture. Note: All monkshoods are poisonous in all of their parts. Keep this­­­­­­­­­­­­­­­­ in mind when dividing, and if you garden with very small children.